If you are on the job hunt in these times, you are quickly realizing (or have already realized) that it’s a tough, tough world out there today. Aside from the job market being weak, there are so many different things you have to do now to even get noticed by employers. That is difficult in and of itself, but your hard work doesn’t end there. Once you are noticed by an employer, you have to sell yourself until you can sell no more. You have to prove to them why you are the best candidate out of 15, 20 maybe 30 other candidates. Just thinking about it makes me exhausted, but that is the reality of the job hunt today. You can brush up in your self-sales skills, but the whole process starts with you being seen, right? If you don’t stand out from the crowd from the get go, you’re pretty much doomed. That is why Spark News thought it was a good idea to try and help you get seen. There are a number of different things you can do today to increased you visibility in the market. For starters, you should get yourself acquainted with Spark Hire. One of our main goals is to help job seekers stand out from the crowd and become more than just a resume. 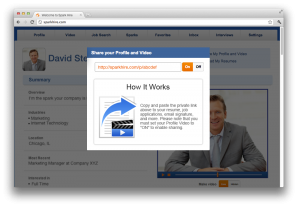 With simple, easy to use video technology you can record a video resume and share it with tons of employers. Not that it should replace your paper resume, that’s still important, but a video resume should definitely supplement your documents. In a video resume you can put yourself in front of an employer and tell them right away why you are the best candidate for their open position. It’s a great way to showcase your communication skills, your personality and your passion for your work. Spark Hire is one way to set yourself apart from the competition and increase your visibility, but there are many other ways as well. At the core of increasing your visibility is networking. The more people you know in your industry, the easier it will be for you to find a good job. You need to remember, though that networking doesn’t just mean you know the names of 20 employers in your industry and emailed them to make yourself known. To network, and to network the right way, you have to really get to know these people and actually have some conversations with them. They don’t have to become one of your friends, but they should be able to remember your face if they saw you on the street. That is why networking events such as career fairs and university hosted events are a great way to expand your network. In order to really seal the deal when networking, make sure you are employing the right actions, the right conversation topics and the right exits. Take a look at our article on how to end a networking conversation, since sometimes it can be a bit awkward. Also, remember that small talk can really take you a long way. Make sure you aren’t wasting anybody’s time and make your small talk count. Online methods are a great way to get your networking circle started, but without real-life interactions those online connections may not count for much. In terms of your online presence though, there are things you can do there as well. First and foremost, it should go without saying that your online profiles must be professional and clean. You can make yourself visible, but if what companies see is not satisfactory then what is the point? When your profiles are all acceptable and professional, make sure you are spreading them around whenever you can. If you have a LinkedIn profile and a Spark Hire Profile Video, add them to your resume, your cover letter and your emails to recruiters. Video resumes are gaining popularity, but a lot of employers are still learning about them. If you send one on to an employer with your resume, it’s likely going to gain you some attention. This is exactly what you want. Even if it’s not the position for you, you were noticed and the employer probably won’t forget you. So you see, increasing your visibility in the job market isn’t necessarily difficult, but it certainly does require some work from you. If you don’t have one already, create a Spark Hire Profile Video today and start sharing it with your network to be seen.